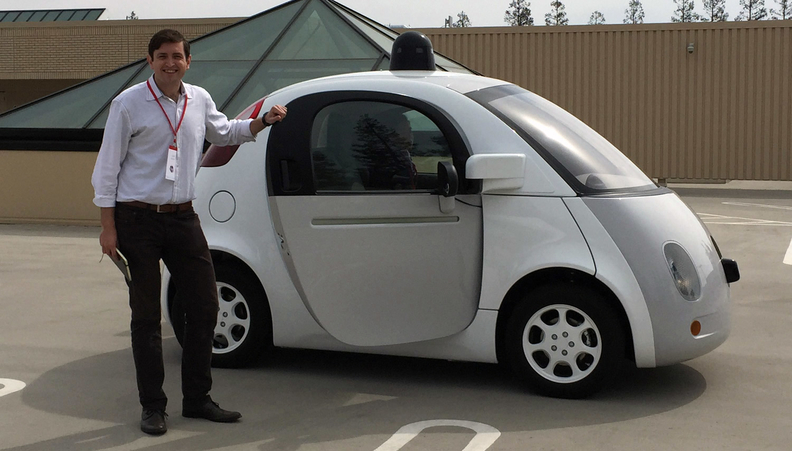 MOUNTAIN VIEW, Calif. -- When I stepped into Google’s latest prototype of a self-driving car, the first thing I noticed was the lack of a steering wheel and pedals. The second thing I noticed was a display screen, perhaps 6 inches tall and 18 inches wide, with a pastel blue background and a cartoonish image of Google’s prototype: a round white pod with a grey face resembling a koala’s. “Welcome,” Mr. Koala Car told me through a speech bubble. It left me with a warm, cuddly feeling of trust, even when the car malfunctioned with me inside, slamming hard on the brakes and refusing to move. I’ll get to that later, but first, let me explain how I got there. On Sept. 29, Google hosted a group of journalists at its headquarters for rides in its cutesy prototype. Mile by mile and day by day, Google is getting closer to bringing its cars to market -- its current goal is to start deploying them for public use by 2020 -- and the technology giant wants the world to understand how they work. Google had a two-seat pod waiting for me on a rooftop parking deck that it converted into an obstacle course for its prototype. I jumped inside. “Press ‘go’ when ready,” the light-blue navigation screen read. “Let’s go!” the screen replied. Then the car took off around a rooftop obstacle course, gliding with an otherworldly whirring sound that pedestrians could not possibly miss. As the car drove, the screen showed an overhead view, as if a drone was flying 20 or 30 feet above Google’s car and beaming down an animated version of the world. Concentric circles rippled out from the Google car with a quiet pinging sound, like a radar screen from a science-fiction movie. All of the objects around the car, from pedestrians to cyclists and cars, were represented by stick-figure-like animations of those objects. When they move, so do the stick figures. In front of the car, a Google employee started walking across our path. The car slowed down, and displayed a corresponding stick-figure pedestrian walking across the road. Around the corner, a white Ford Fusion pulled out in front of us. Same story: The car slowed down and the screen showed a representation of a car. And then, something went wrong. The car slammed on the brakes. I thought it was part of the demonstration. Perhaps the car was being cautious because it couldn’t predict what a cyclist, riding 30 feet ahead of us, was going to do. So I sat there, just as confused as the car. There was nothing I could do. On the center console, there are buttons to adjust the volume, switch on the overhead lights, lower the windows and turn on seat heaters. There is also a green “start” button that turns yellow and displays the words “pull over” while the car is driving. There is a red “stop” button underneath a plastic shield so it can’t be pressed by accident. None of these offered any help. So I waited for the roadside assistance crew, a pair of frustrated-looking engineers. They were all business, hardly making eye contact as they asked me to get out of the car. One of them plugged a laptop into the car and silently ran a diagnostic program. “Do you know what happened?” I asked the second engineer. A few minutes passed. Unable to fix the problem, the engineers put the car into “manual mode” and drove it away with a handheld joystick. I walked back to the start of the obstacle course, where Dmitri Dolgov, the longtime software lead on Google’s project, explained what went wrong. Google uses special software when it tests its prototype on the rooftop obstacle course, Dolgov told me. It’s basically a remote kill switch. For the car to keep driving, an observer must keep holding down a button. If anything goes wrong, the observer releases the button and the prototype slams the brakes. In this case, Dolgov said, the observer hadn’t actually released the button. Google’s engineers suspected that rogue electronics on the roof -- perhaps the television cameras that other news outlets were using -- had interfered with the signal. To be clear, I don’t see the breakdown I experienced as a big deal. Google says it has tested its cars for 1.2 million miles on public roads without the software causing a crash, so the software probably isn’t prone to slamming the brakes without reason. Google knows that a single unsettling crash could set back the technology by years, even in a demonstration, so it’s easy to understand the company’s caution. Its prototype even has redundant brakes and steering so it “fails safely,” Jaime Waydo, a systems engineer on the self-driving project, said later. If the primary system fails, the car pulls over to the side of the road and calls for help. I am also heartened by how I felt when the car slammed the brakes. It wasn’t scary. Granted, I wasn’t sitting in traffic with honking cars around me, but Google’s car conveys its technology in such a simple, friendly way that I trusted that the car knew what it was doing. It’s a testament to the pains that Google’s designers are taking to make the self-driving car seem like a friend, not an intimidating machine. Google let me go through its obstacle course a second time to see what happened at the end. This time, everything went as planned. The cartoonish image of Google’s car reappeared on the screen with a message. Bye bye, Mr. Koala Car. Next time, I trust, there will be no surprises.